The stock had a great 2016. Next year could be a repeat if things go right. Shares of International Business Machines (NYSE:IBM) have surged so far this year, up about 20% year to date. This rally was preceded by a multiyear decline; the stock is down about 15% over the past five years. IBM has been engaged in a prolonged effort to transform itself into a company that can thrive in the cloud. The result has been years of revenue and earnings declines that have knocked down the stock. The good news for IBM investors is that there have been clear signs of progress. Revenue is still in decline as legacy business shrink, but IBM's growth businesses, which now account for around 40% of revenue, continue to grow at an impressive pace. 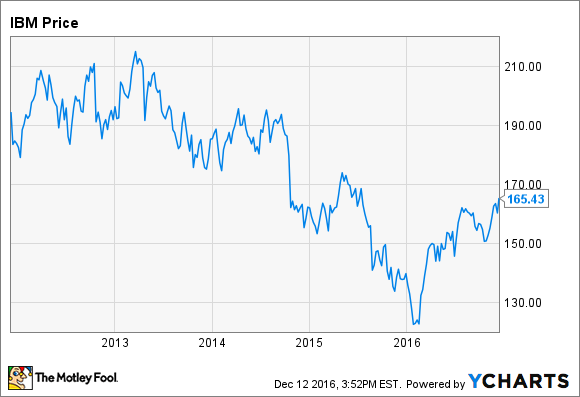 Looking forward to 2017, here are three reasons IBM stock could continue to rise. IBM expects to produce adjusted EPS of at least $13.50 this year. That's down from $14.92 in 2015 $16.53 in 2014. This year will also mark the company's fifth consecutive annual revenue decline. Divestitures and currency fluctuations have contributed to IBM's shrinking top line, so the situation isn't quite as bad as it seems. But a half-decade of slumping sales is never good news. IBM has been focused on growing its strategic imperatives, which include cloud, analytics, mobile, social, and security. These businesses generated $8 billion of revenue during the third quarter, growing by 15% year over year. Cloud revenue was up 42% to $3.4 billion, and the annual run rate of IBM's cloud-as-a-service businesses reached $7.5 billion, up 65%. This growth is being balanced by declines in legacy businesses, but an inflection point could be on the horizon. IBM will report its fourth-quarter results in January, along with guidance for 2017. An outlook that includes higher earnings next year could light a fire under the stock. Even flat earnings guidance would show that IBM is stabilizing, and that the worst is over. The moment IBM returns to growth, the stock could soar. Watson, IBM's cognitive computing system, is the face of the company's transformation. The system was used to win Jeopardy! in 2011, and has since been unleashed into a variety of industries. IBM is making a big push in the healthcare industry, where Watson is being used as part of various partnerships to improve diagnoses and patient outcomes. The company shelled out $2.6 billion earlier this year for Truven Health Analytics as part of this effort. IBM CEO Virginia Rometty saw Watson becoming a $10 billion business within a decade back in 2013. Unfortunately, the company doesn't break out Watson revenue directly. A recent reorganization of its reporting segments provided no insight, with the cognitive solutions segment including legacy software that muddles the numbers. At some point, IBM is going to need to show that Watson is capable of producing a significant amount of revenue. The big question: will IBM have an "AWS moment," where the business turns out to be far more successful than nearly anyone expected? Or will Watson's results fail to live up to the expectations? A reveal of Watson's financials could send the stock higher if investors like what they see. IBM has raised its dividend for 21 consecutive years, and it has paid a quarterly dividend without fail since 1916. A dividend increase is very likely coming next year, with an announcement in late April or early May. I wouldn't expect anything more than a mid-to-high single-digit percentage increase. But IBM could go bigger, especially if its earnings guidance for next year beats expectations. The company reduced how much it spends on share buybacks in 2015 and 2016, and it may slow down its pace of acquisitions after going on a buying spree over the past year. This could free up more cash for a larger dividend hike. A big dividend increase would likely require a return to earnings growth, but it would give investors more confidence that IBM is committed to growing its dividend. Coupled with solid guidance, a larger-than-expected dividend hike next year could keep the party going for IBM stock.